May is a special month at Pheasant Field Bed & Breakfast. We hosted our first guests in May 1994 - that's 17 years ago! Over the years, we've grown from 4 rooms to eight rooms and from 8 acres to well over 10 acres. We've met so many wonderful people - some come back again and again and leave footprints on our hearts; others pass through our area only once but still provide great memories . Thanks to YOU for choosing Pheasant Field as a resting place, a quick stop over, a retreat center, and as a home away from home! We appreciate you and look forward to a continued relationship - indeed - a friendship with all of you! We've been innkeepers for over 17 years, but Chuck & I have now been married 30 years! Recently we had guests who were celebrating their 1st anniversary. We also help celebrate at weddings held here at Pheasant Field Bed & Breakfast. We host special guests who have been married as many as 60+ years! So we experience the joy of young love and the warmth of seasoned couples. 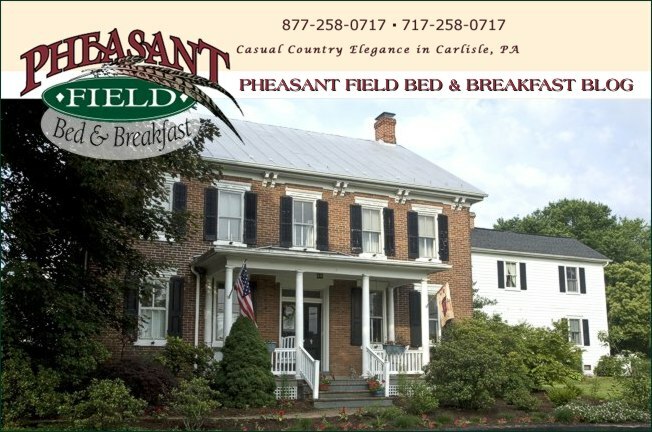 Whatever stage of marriage or life you're currently experiencing, Pheasant Field Bed & Breakfast provides a comfortable place for a celebration, retreat, or just a quick getaway. This weekend is Mothers' Day. You can surprise Mom with a getaway at our B&B. Check availability for HER special room!